Jesus is asked a question – but as usual the question is not good enough to get a direct answer. But fear not, the spirit of truth is coming. 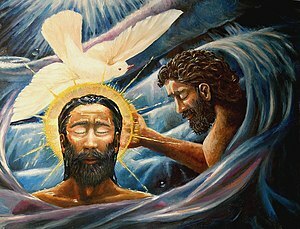 Philip said to him, ‘Lord, show us the Father, and we will be satisfied.’ 9Jesus said to him, ‘Have I been with you all this time, Philip, and you still do not know me? Whoever has seen me has seen the Father. How can you say, “Show us the Father”? 10Do you not believe that I am in the Father and the Father is in me? The words that I say to you I do not speak on my own; but the Father who dwells in me does his works. 11Believe me that I am in the Father and the Father is in me; but if you do not, then believe me because of the works themselves. 12Very truly, I tell you, the one who believes in me will also do the works that I do and, in fact, will do greater works than these, because I am going to the Father. 13I will do whatever you ask in my name, so that the Father may be glorified in the Son. 14If in my name you ask me for anything, I will do it. Why do you think Philip asked that question (v8)? ‘Another Advocate’: what is your sense of the meaning of ‘paraclete’? What might it mean to do ‘greater works than these’ (v12)? Do you find the prospect of the ‘Spirit of truth’ comforting – or is there a bit of threat in there for you? What do you feel about Father and the Son coming to make their home in you? Are you that hospitable? Do you have a ‘Philip question’ in you that you need to ask someone? Can you identify the works that you do? Can you find one practical way to obey the commandment to love your real-life neighbour? At the centre of this brief passage lies one of the most memorable encounters in the Bible. That between the risen Jesus and Thomas a week after Easter Day. 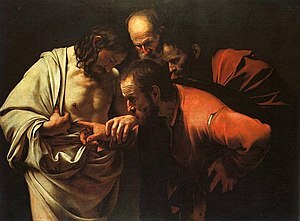 Caravaggio has Thomas intently inspecting the evidence. But that is not the picture John paints. He suggests Thomas’ doubt is very short-lived. ‘doors of the house’. v 19 Although much has been made of the stone that sealed Jesus’ tomb, not so much has been made of the locked doors of the upper room. John tells us why they were locked. But our interest is more in their solidity than in the security they afford. What do the locked doors tell you about the risen Jesus? ‘he breathed on them.’ v 22. We immediately think of this breathing as congruent with the idea of spirit as breath, and remember the animation of dry bones in Ezekiel’s valley. But maybe should see it in the context of other acts of breathing in John’s gospel. What happens to your imagination if you compare this out-breathing with that of John 19.30? ‘Unless…’. v26 This is how Thomas begins his utterance. With a demand. ‘My Lord and my God!’. v28 Thomas again. Many people identify with Thomas. You might be one of them. There are number of reasons for doing so. For instance, you might feel like the typical outsider, the one who would be unlucky enough to miss out on something really special. Or you might be someone who knows the keenness of doubt. Or maybe you identify with this outburst of faith or the cry of reckless discipleship in John 11.16. Which Thomas do you most easily identify with? What about the people you preach to? For many people life is lived in different places up and down the spectrum between 100% doubt and 100% faith. Where are you now?